When oysters are left to grow, they form highly complex and irregular reefs. This is a result of the natural reproduction process by which larvae is set onto existing shells. These new shells clump together with older ones, and grow upward toward the surface. When the reefs go unharvested, they grow into mounds or plumes. When they’re left alone for a long time, the mounds can reach the surface of the water and be visible at low tides. In regions where oysters are plentiful, they call these mounds “oyster rocks.” That’s a term you don’t hear too much in Maryland because there aren’t any oyster rocks left. In my first book, I wrote about how important it is to fish over live hard bottoms. “Live bottom” is a term I learned from Chesapeake Bay Foundation Senior Naturalist and Admiral of the Chesapeake John Page Williams. It means places where the bottom of the Bay is covered with living shellfish. Thanks to the recent implementation of oyster sanctuaries in Maryland, we’re seeing more live bottom now than we have in years. As these reefs grow, they provide more and more places for marine creatures to thrive. I refer to reefs with lots of contour as live 3-D bottoms. 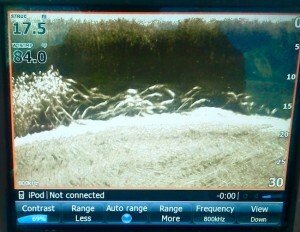 These 3-D bottoms are fantastic places to fish, and that’s what I was seeing on my fish finder. When I started fishing the Chesapeake region about a decade ago, I remember wondering why the Coastal Conservation Association (CCA) was so concerned about oyster reefs. “Those guys must really like oysters,” I thought. Once I started learning about the ecology of the Chesapeake, it all made sense: oyster reefs are the foundation for a healthy Bay. They provide a wealth of habitat for hundreds of species of marine animals including many species of fish. They also contribute to improved water quality because they are filter feeders. 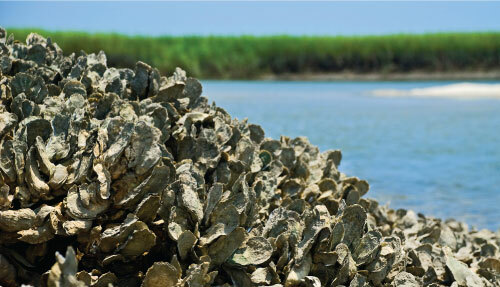 One oyster can filter up to 50 gallons of water a day. Have you seen this photo yet? 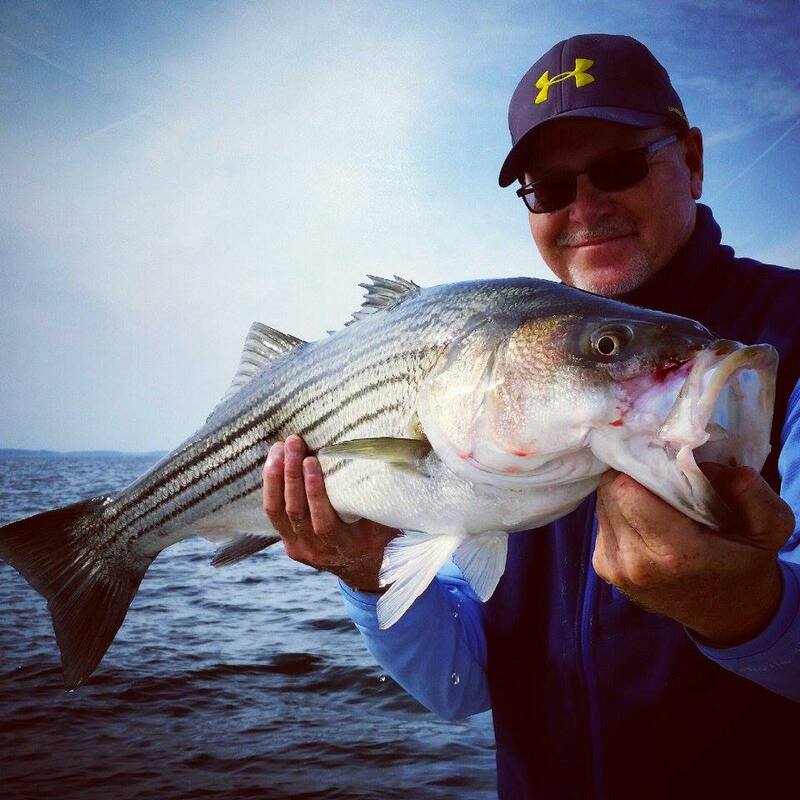 https://twitter.com/SteveVilnit/status/523601553513803777 Maryland DNR’s Director of Fisheries Marketing, Steve Vilnit posted it on Twitter last week. It went viral and has now had more than a million views. There is a line of thought among the commercial oyster harvesting industry that oyster reefs in the Chesapeake should be plowed up like a farmer’s field. Some people believe that harvesting oysters by power dredging removes silt that is deposited by muddy water. They think that tilling them up on the bottom cleans them up and makes it easier for them to reproduce. That theory has been scientifically disproven time and again, but rumors die hard in the Chesapeake, especially when there is financial incentive to keep them alive. Power dredging can be very harmful to fish habitat because it flattens and destroys the natural 3-D nature of oyster reefs. When the reefs are leveled, there are fewer places for marine animals to hide. The name Chesapeake means great shellfish bay because there was once so many oysters here. Unfortunately, the wild shellfish of the Chesapeake are nearly gone. Scientists estimate that populations are currently at 1 percent of historic levels. 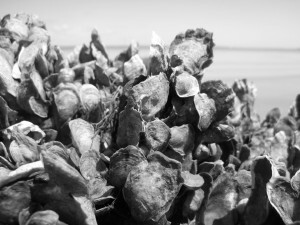 Overharvest and disease has nearly destroyed the Chesapeake Bay’s native oyster reefs, yet surprisingly, the harvest of wild oysters continues. Since I found that oyster reef in the Mid-Bay, I’ve kept it a secret. I’ve shared the GPS coordinates with exactly two other fishermen, one of whom no longer lives in this area. I even drift away from it when another boat comes near because I don’t want anyone to see me fishing there. It’s not that I’m concerned about anyone catching the fish that live there – I’ll sometimes share good fishing spots with other anglers –the reason I’m so protective of this place is because I don’t want to give the location of the reef away. It isn’t in an oyster sanctuary. All the oystermen I know are good guys, and I understand that they need to make a living, but I also know that if the commercial dredging fleet finds it, they will level it in a matter of hours. I have no idea how or why the oyster reef I found has survived. It might be because it’s several miles from land and smack in the middle of one of the widest and most remote areas of the Bay. One thing is for sure: fish love it. It’s less than 100 yards long and 50 yards wide, but this spot has been responsible for some of the biggest rockfish I’ve ever caught. It’s also a great redfish spot. I’ve caught flounder, bluefish, spot, croaker, perch, and even a blowfish over those oysters. When I’m fishing it, I sometimes see sea turtles and the occasional dolphin surfacing nearby. Even though I haven’t told many people where it is, I have taken a few fishing buddies to this reef. I fished it recently with my friends Dr. Ken Lewis and Larry Jennings. Since both Ken and Larry are very active in oyster advocacy, I couldn’t wait to show them this spot. We jigged fish until our arms got tired, then we switched over to topwater lures and landed fish after fish until dark. It might sound unbelievable to catch nice fish on topwater in the middle of the wide open Bay with no sign of birds, breakers, or even bait on the surface, but that’s the kind of spot it is. It’s almost like a small aquarium right in the middle of the Chesapeake Bay. It’s a tiny glimpse into what the Bay could be like if we stopped bowing to economic pressures and restored it to a more natural state. Fishing has been good recently. Striped bass are leaving the shallows and schooling up near the mouths of the rivers where they are chasing bait. There are a lot of small fish around, but if you know what to look for, this is a good time of year to catch 30-inch-plus rockfish. For most of the year, I fish around points, underwater ledges, or structure like bridge pilings, but not in November. In late fall, I look for birds. Don’t get me wrong – I still run the ledges and pay close attention to water depth and bottom habitat because, even when fish are feeding on the surface, they are likely to be near areas with live bottoms. Since the bait schools are moving out of the tributaries, the biggest concentrations of fish are near the mouths of the rivers. The key to catching bigger fish in the fall is to find them feeding on peanut bunker. By peanut bunker, I mean menhaden that are between one- and three-inches long. The smaller fish will be chasing much smaller bait like glass minnows or bay anchovies, but the bigger fish want a bigger bite. You can almost always tell the size of the bait by looking at the birds over the blitzing fish. Big birds also want to eat big bait. Ignore flocks of young gray-brown gulls and diving terns. There are several types of gulls in the Chesapeake Bay. Your best bet is to look for big adult herring gulls. Full grown herring gulls have a white head and tail with pale-gray wings and darker tips on the ends of their wing feathers. Mature herring gulls can have a wingspan of four to five feet. 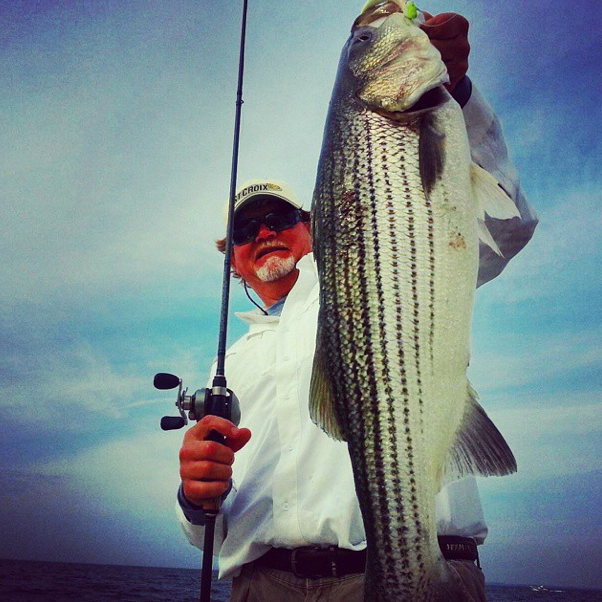 Find those big birds over a striper blitz and you can count on catching some big fish. It’s also possible to pull some nice fish off the bridge pilings this time of year. Some fish will hold around shallow structure until the water near the surface gets in the low 50s, then they’ll look for warmer water pockets down deep. Some of the smaller fish are already moving into deeper thermal layers like the ones around the Bay Bridge rock piles, but you can still catch some very nice fish on the pilings in November. We typically get a few runs of ocean fish in late November. 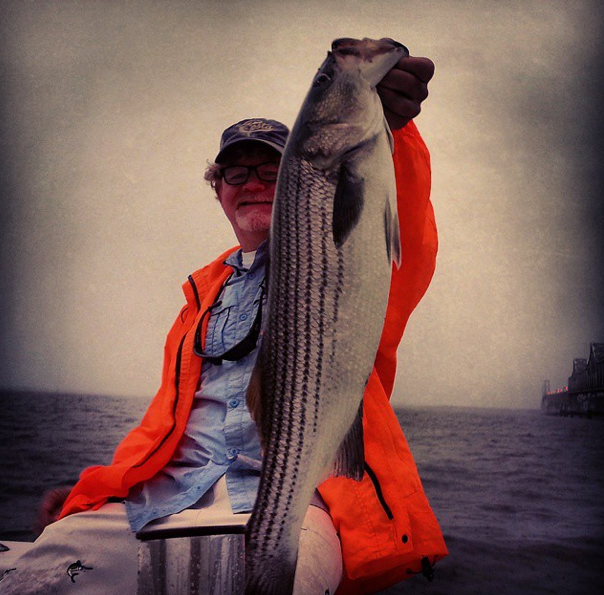 Right now, the ocean schools are migrating down the striper coast. As long as the water is warm enough, the fish will move into the Bay and other tributaries looking for bait. 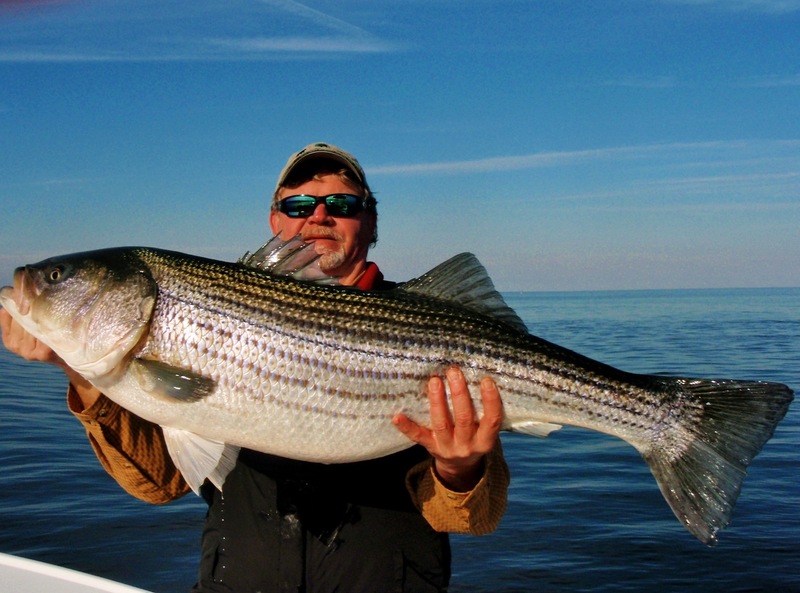 You can recognize ocean-run stripers by the presence of sea lice. 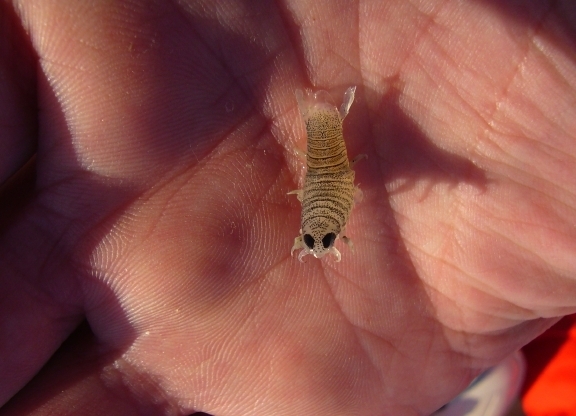 Sea lice are parasitic isopods that attach themselves to the fins and tails of stripers and other ocean-dwelling fish. There are several kinds of sea lice, but the species we see most commonly on fish coming in from the Atlantic look like this one in the photo below. Sometimes you may only see one or two, but when you get on ocean run fish, they literally drip sea lice. They are often so thick that the bottom of the boat can get covered with them. Sea lice can’t live in fresh water, so they fall off after a day or two in low salinity areas like the Maryland part of the Bay. If you see them on fish, it’s a good sign they just came in from the ocean. You can also recognize ocean-run fish by their appearance. Their colors and markings are much more vivid than what you typically see with our resident fish in the Bay. Their teeth are sharper and they seem a lot stronger when they fight. Depending on the weather, we usually see good light tackle fishing through Thanksgiving. If it gets cold quickly, the fish will move deep sooner and we’ll see fewer fish coming in from the ocean. Right now, it’s pretty darn good and it should stay that way for a while. Finally, it deserves to be noted that we won one for the fish last week. I’m sure you’ve heard by now that the Atlantic States Marine Fisheries Commission voted to cut striped bass harvest by 25 percent in the ocean, and about 20 percent in the Bay. It may not be enough to return stocks to abundant levels, but it’s a good start. Minimum size limits in the Chesapeake are expected to go up to 36 inches during the trophy season. Frankly, that’s where it should have been all along. Anyone who considers a 28-inch rockfish a trophy is kidding himself. For the rest of the season, the lower limit in the Chesapeake Bay will be 20 inches. As a result of these changes in size limits, there will be a lot more fish caught and released. This would be a good time for our Natural Resources Department to step in and require non-offset (inline) circle hooks when bait fishing. They are already required in the spring for migrating fish. Circle hooks are a proven conservation practice that should be mandated year round. Read more about them here. Good luck fishing in November. It promises to be a good month. Cheers to big rockfish and good beer, and here’s to enough oysters to make the water pure enough to foster both. Great post, Shawn. You’ve just explained why Bay scientists refer to oyster reefs as “keystone communities.” They are, in fact, the Chesapeake’s version of coral reefs, complete with anemones and hydroids, which are kin to corals. I wonder it we’d treat our reefs with more respect if they were colorful instead of mostly gray and tan. And Graybeard is right to cite Ed Darwin, who fished a healthier Bay when he began carrying fishing parties in the 1960s. That sense of fishing history is part of why Capt. Ed is so successful. The Dorchester Chapter of MSSA knows about this kind of live bottom because they have worked with UMD’s Horn Point lab and CBF to plant a large field of reef balls off Cooks Point in the mouth of the Choptank. 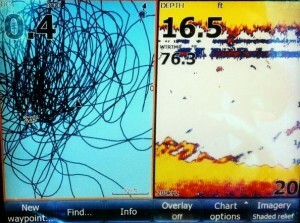 Their catch list is quite similar to yours on your secret spot. Me, I spend a lot of time on the restoration reefs in the Severn, built over the past fifteen years by the NOAA Chesapeake Bay Office, the Oyster Recovery Partnership, DNR’s MD Artificial Reef Initiative, the Army Corps of Engineers, and CBF, all working together. In a couple of weeks, look for a new initiative from CBF and our partners in both MD and VA to promote and build more protected 3-D reef structures up and down the Chesapeake and tributaries. Our fish and crabs need all the live bottom we can give them! Best fishing spot in the bay is the false bottom…good read my friend.. This is a great story and very good advice. I always thought oysters just laid flat on the bottom. What are the chances of preserving that reef you found by turning it into a sanctuary? What a fantastic article and an incredible perspective about the treasure that the Bay has been and could be, if treated respectfully. Thank you for this. Whoever tweeted this, thank you. I agree about keeping oysters in the Bay instead of taking them out. My husband likes to fish and I like oysters. LOL! Unfortunately, if the reef were to be established as a sanctuary, then the reef’s location would become known, increasing the potential for someone to go in there and poach it! 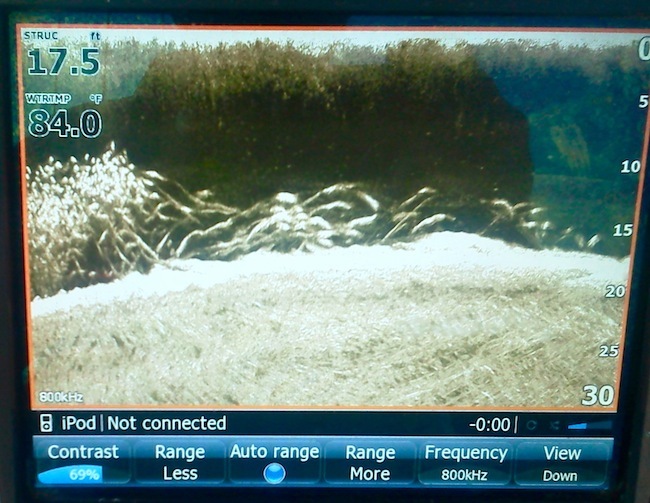 Best not to disclose the location or the location of similar small isolated oyster reefs that were missed by oyster dredgers or have subsequently developed. Hi all. Is there anywhere near Crisfield where I can find Rockfish in July? We have a boat, been vacationing there for years but just croaker, spot, and a few skate and kingfish. Found the deep trench off Janes Island (where we stay) but can’t get anything big. Any help much appreciated! It’s pretty obvious that the one picture with the guy in the orange jacket was taken just south of the Chesapeake Bay Bridge off Sandy Point (can see it in the right side of background). 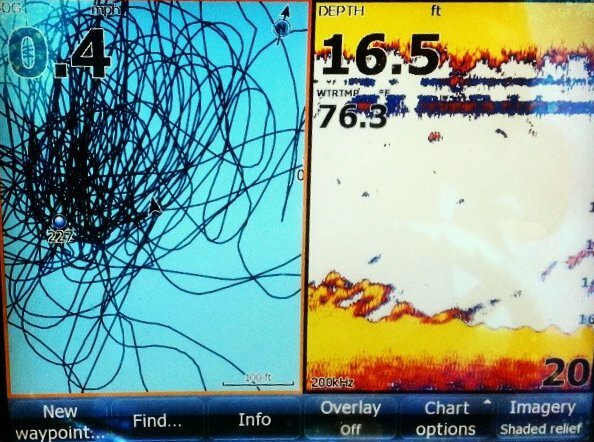 This is a well known striper hotspot. That said, this is definitely not “smack in the middle of one of the widest and most remote areas of the Bay” so I don’t think these pictures are necessarily catch from the mysterious reef referenced in the article. Reading is fundamental my friend. You have a great fishing website! 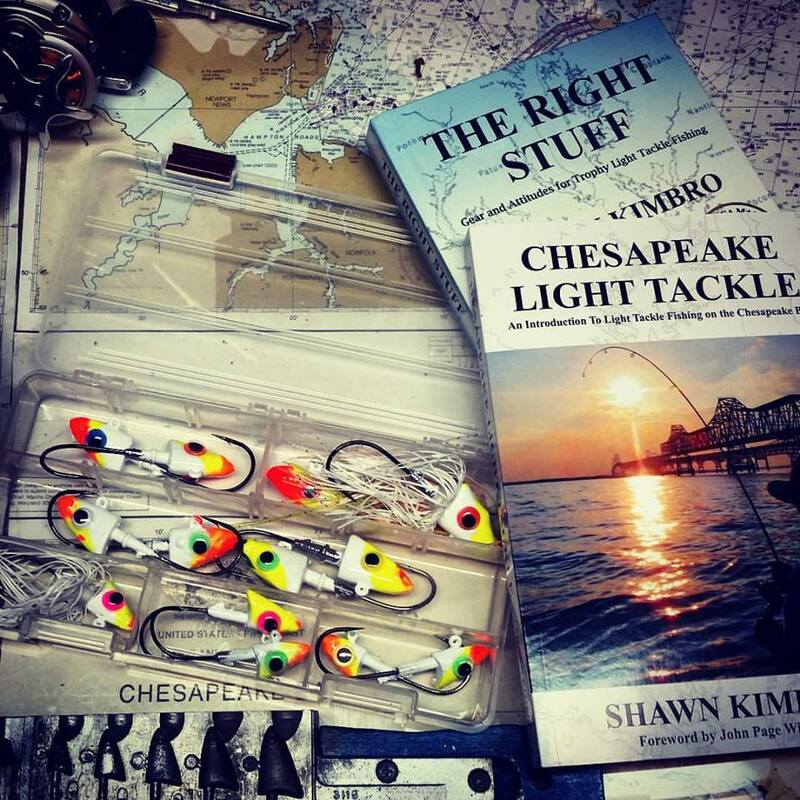 Have a quick question: where is a good place to fish for a pair of guys who love the Chesapeake and don’t fish too much. My bro is coming up from Vienna, VA, while I’m coming down from Middletown, DE. We’ll just be fishing for the day. Would be grateful to any input you have.